Can China cure the carp crisis? Like many of our interns, Silu Guo learned plenty about Asian carp while reporting for Great Lakes Echo. The fight to keep the invasive fish from entering the Great Lakes and screwing up the ecosystem certainly chews up a lot of news hole on Echo and elsewhere. Silu returned to China last January and finished her coursework long distance to earn a masters degree from Michigan State University’s School of Journalism this spring. Since her return she also has been interning at news publications in Shanghai and Beijing. Recently she emailed that she’ll soon start working at Southern Weekly in Guangzhou. She’s pretty excited about that because she says the publication has China’s only environmental section. As it turns out, while Silu has left the Great Lakes region, she hasn’t left news about Asian carp behind. In fact, it’s rather newsy over there. 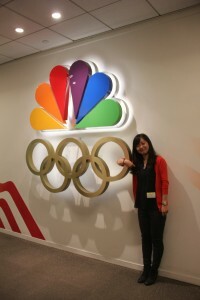 Silu Guo at her internship at NBC News. And if you sit through the soft drink commercials in this video, you’ll see a carp capture spoof that requires no translation. What’s more, Silu says that a popular posting on the Chinese version of Twitter advises that the best way for the U.S. to control Asian carp is to accept one million Chinese immigrants to help eat them. It turns out that something like that could happen, although the carp eaters would stay home and the U.S. fish may emigrate to China. The Christian Science Monitor recently reported that a Chinese company is opening the first fishery in the U.S. dedicated only to processing Asian carp. The company plans to open an operation near the confluence of the Ohio and Mississippi rivers to buy fish locally and process them for overseas consumption. Don’t get too excited. Fisheries experts say that at best exporting processed carp to China could only cut the population, not eliminate it. We ALL need a healthy lake/ecosystem. We DON’T need salmon or alewives. Which means whether you catch a salmon or not is not the most important thing, but you already knew that. So they should protect every wolf, mosquito, no-see-um, tick, flea and horse fly, too? How about every tree, even if it means an old growth forest that no longer can support the vibrant wildlife populations that attract hunters that fund conservation programs enjoyed by all? The salmon/alewife plan is not destroying a natural resource. Alewives, like most exotics, made it here on their own (with man’s help), and feed a thriving sport fishery. The rest of the food chain has been disrupted by quaggas and spinys (among others) taking out plankton and zooplankton, respectively. You’re asking to try to sacrifice a sport fishery worth millions to each port along the lake on a wing and a prayer that perch “might” come back (even after a decade, they still haven’t in Huron). Face it, the lake is forever changed. Folks who want perch (and I’m one of them) can still catch them in many bays, harbors, lakes and rivers. Ironically, perch are intentionally killed off in some states and provinces as “bad” fish. Here’s the latest example of how “invasive” perch are being targeted for removal by stocking tiger muskies so a trout fishery can be revivedL: http://www.oregonlive.com/pacific-northwest-news/index.ssf/2013/06/hybrid_fish_stocked_in_eastern.html. Scoop it’s pretty simple. We have every right to expect the DNR to protect OUR natural resources. There’s this Public trust thing. You and your friends have no right demanding or even asking the DNR or the rest of us to do anything that is detremental to or destroys said natural resources. The salmon/alewife plan is destroying the natural resource, thus you have nothing. Can’t put it much plainer than that. Tom, nobody is concerned with protecting jobs of Asian carp processing plants, other than perhaps the processing plant owners and employees. As for Huron, while ports there are trying to paint a rosy picture to keep folks coming, the true story is in the stats of charters that went out of business. “The collapse of Lake Huron’s chinook fishery cost many coastal communities millions of dollars in lost tourism revenue, according to state data. Alewives crashed a decade ago on Huron, and perch still haven’t rebounded? Mussels, spiny water fleas and other invasives that are nothing but takers in the Lake Michigan system are the real problem, but some folks would rather blame the MDNR and folks crazy enough to realize that salmon are still king. Scoop, the towns didn’t dry up along Huron, the people didn’t pack up and move to a town with salmon because they “can’t survive without salmon aaaaaah!” These Asian Carp processing plants are creating more scoops, “you have to protect Asian Carp without the carp jobs the town will dry up and blow away aaaaaaah!” Paid for with public funds. We are creating the same problem we have now giving an invasive species value, when they have no true value, less than nothing. Also paid for with public funds!AAAAAAAAAAAAH! Tom, salmon are indeed worth BILLIONS because for every charter there are dozens of private boats! In some ports, there are only a handful of charters and 100-200 privates on a weekend. You do the math! The figure also includes pier, shore and stream fishermen, numbering in the tens of thousands of anglers who get in on the action occasionally in summer when the wind is right and then September-November in the nearshore/river runs. Lake Michigan and Green Bay also have thriving native species fisheries, “keystone” species, too, like the walleye and perch. World-class walleye, smallmouth bass and muskie fisheries on Green Bay (Lake Michigan’s largest bay). A PS. for all you scoop fans. Lake St Clair doesn’t have an alewife problem, it has a thriving Muskie and native fish population. Alewives and Perch coexisted as in being in the same waters perhaps, but they don’t do Perch or any other native fish any favors. Perch and walleye are keystone fish in our natural ecosystem. Zooplankton is the most important keystone species in our ecosystem. Alewives or any other invasive species cannot be. Plus According to the Charter boat survey from the MDNR website 239,000 clients spent an estimated $21. million dollars in addition to charter fees in “1985” now this amount does not translate to a billion anything let Alone “billions” plus by thier own admission charters., license sales and interest has been dropping since then, so how can salmon still be worth billions? This statement has been thier lead in for several years now. This is not 1985, things have changed drastically, and can be traced to the mismanagement of the resource (AKA managing the lake for alewives) since 1985.) Things have changed, we must change or lose it all. They say we must be proactive, but but it appears only with alewives. Dear Joe, Yes Sir politics is science, the science of lies and half truths, and failure to mention stuff usually facts. I am at a disadvantage as I refuse to pay my “public” representitives twice to make my opinion the “new truth” which is what politics has turned into these days. If you donate enough money the right way, a “new truth” emerges almost daily,then pass a law saying it’s so. We got almost 3 times more support for Perch restoration than the DNR did to save alewives 1560 to less than 580, without much effort. The DNR other survey of over 10,000 people listed control invasive species, and restore native fish as No 1# and Number 2# priorities the DNR should focus on. So naturally we’re saving the alewives. We could form a P.A.C. and buy back the truth, but that’s a waste of time and money, we don’t have the time. Shouldn’t have to anyway, laws pretty clear to me. Science is supposed to find the truth, the facts, not support lies or special interests. Natures law doesn’t change. Now Mr. Waste your right, the DNR in this is pure conflict of interest, they don’t get paid to protect invasive species. And I believe if you look, and you have to look hard, the towns in Huron didn’t dry up, and some money was lost to some, but not billions not even close. Ohio says it’s Erie fishery is worth $11.5 billion (no salmon) Minnesota also it’s fishery $11.5 billion (also no salmon) so if we want to base our actions on numbers, we could double the economic value (Michigan $4.5 billion DNR says) by going back native, trade up if you will. Given more people can afford to fish Perch and Walleye I’m more inclined to believe Ohio and Minnesota, and I’ve seen the crowds at Saginaw Bay and Detroit river, not seen here in a very long time. But we must do what’s right for the lake, and we adjust not the other way around. OK, lets address Mr. Scoopy’s items First and foremost “quagga mussels No#1 bad invasive species” not alewives. Quagga mussels are competitors of Zooplankton, Alewives are PREDATORS of Zooplankton and Larval fish. With or without Quaggas alewives eat zooplankton ALL fish need, then even if larval fish have zooplankton, alewives eat them anyway. Invasives are finding zooplankton, algae blooms are there, Quaggas ain’t eating it all, so Alewives/invasive predators far more negative impact than Quaggas. Huron being a huge example. Native fish have adapted to the invasive food including the mussels, and live much longer, thus most cost effective control, many more options, at low cost eventually no cost, (except restraint on our part “over Fishing”) with Chinook we have one option and one option only, protect the alewives. With multiple invasive species ranging in the billions, plus impending asian carp, we need multiple options, not one. Sacrificing the entire ecosystem for one fish, is way past being a bad thing. I shall have to rethink getting involved with the nature conservancy if they have the same views as scoop. I agree Tom, but politics is science, it’s all based on philosophy. My problem is Scoop makes assertions instead of discussion. Without discussion there is no argument. Only disdain. My point of view is there is nothing wrong with fishing salmon for profit. So if salmon charters are losing money then there should be a discussion, not an assertion. Otherwise, we just might see Scoop argue about the validity of politics again. Nothing wrong with that. But consider this: it takes a better than 5-pound average PER BASS to win tournaments on Lake Michigan’s Green Bay, and fish of 6+ pounds are regularly caught. The winners of the Sturgeon Bay Open last month had more than 36 pounds on six fish on day one (6+ avg. per fish), and ended with 67.13 pounds (5.59-pound average). Tourney anglers weighed more than 6,600 pounds of bass on 1,606 fish brought to the scales, 4.1 pounds per bass average. The heaviest bass of the event went 8.45 pounds! These too are natural recruits. So are the abundant “toothy” pike, walleyes and whitefish. But while dozens to 300 might show up for a bass or walleye or ice fishing tourney, 500-2,000+ is typical for a salmon fishing contest. Salmon in WI are supported not by tax dollars, but by the Great Lakes Salmon & Trout Stamp. They are also naturally recruiting, mostly from the Michigan side and also from Canadian waters of Lake Huron, then filtering in. Toothy predators. You guys keep mentioning this. Those predators were abundant in the Mississippi system when Asian carp first got in. They were (and still are!) abundant in places like Lake Erie, Lake St. Clair and Lake Michigan’s Green Bay when mussels and gobies first arrived. You cannot eat enough mussels and gobies to stop them. Those toothy predators don’t even live at the same depths, in many cases. They also eat gizzard shad, alewives, gobies, drum and an endless supply of other morsels. I’m a member of The Nature Conservancy. I value wetlands and all sorts of wild areas. But “saving the lakes” is not as simple as you make it sound, and alewives and perch coexisted for many years before mussels arrived. Forever-changed ecosystem. Don’t throw the baby out with the bath water. Good luck with your lawsuit. Bring it on! Scoopy you are hopeless. So too many predators (salmon) will wipe out the alewives, but more predators for the other invasive species wont do any good? Increasing the alewives increases all invasive species, increases thier spread across the state and beyond. Increasing alewives and ignoring the other invasives puts us on a fast track to Dead Zones, no fish for anybody, and your OK with that? You and the DNR still refuse to explain how all native fish are coming back in Huron, with Quagga mussels only change was no alewives? Only 10 to 12% fish Lake Michigan yet they generate more money than all the other fishing combined? Really? In the last 20 years I don’t want to count all the bait shops that closed, not to mention license sales/interest drop, but that’s just facts, we don’t want to use facts. So who will you blame for Asian Carp taking over? Mussels? Chicago? The Feds? What will you do? Plant Alewives? Plant more salmon or trout? Electric fences across every river? Drain the swamps and backwaters (salmon don’t need them anyway right?) Just keep watching our lakes die so you can catch a chinook, right? Science by politics is not science. You can’t vote to change natures laws, doesn’t work, never will. MICHIGAN DNR you should be ashamed of yourselves — this is a dark chapter in your history and blight on your service to the community. You sold out to special interest groups and you chose short term economic gains over long term sustainable fisheries management. Michigan DNR — you chose to support invasive and non-native species restoration over native species restoration in the Great Lakes — what a frickin’ joke you have become. Does any fisheries employee in the DNR have courage to stand up for what’s right here (culture of fear)? I know that if you do, you might lose your job so I understand the catch-22, but seriously are you there just for a paycheck? Michigan DNR — You chose, almost unilaterally, to stock less chinook salmon (66% percent decrease) to save the alewife in Lake Micihgan and Lake Huron. The alewife negatively harms walleye, perch, bloater (or chubs, which still supports commercial fisheries) and deepwater sculpin recruitment (all native species) and population numbers. You chose non-native species over native species restoration. The literature is clear on these facts and your actions are clear despite how subversive and secretive you have tried to be on the subject. Further, lake trout, the “keystone species” in Great Lakes fisheries will never be able to have naturally recruiting, self-sustaining populations in the Great Lakes so long as alewife are present and abundant — you want chinook, you can keep wasting dollars that have been continually spent for the last 60 years in trying to restore naturally recruiting lake trout populations — the KEYSTONE (most important in the foodweb, controls everything directly or indirectly) species in Great Lakes fisheries for Gods sakes you morons! The effects on native species are all documented in scientific literature written by some of the most respected researchers working on the Great Lakes. It’s very clear. To manage this fishery, to keep chinook around, requires alewife. Alewife are one of the most harmful species the Great Lakes has EVER known. Read up on it, it;s not hard to find the information. Chinook were brought in specifically to get rid of alewife, and they have been doing such a good job (because the Michigan DNR was also too dumb to realize they began to naturally recruit and boom in numbers on their own, without stocking, nice work, including years when no fin clips were done you idiots!) that alewife are almost gone from Lake Huron – finally, after 50-60 years of trying to get rid of them. They have been at their lowest historical numbers ever, since record keeping began. And right now, we have the chance to get rid of them. And now, based off special interest charter fisherman, the DNR goes out of their way to SAVE The alewife. Are you kidding me? For what — a few charter fishermen? What about the millions of people that don’t charter fish for salmon but fish for native species like perch and walleye? Taxpayers should be up in arms about this. It costs millions upon millions, if not billions to manage and stock chinook each year. It requires unending taxpayer money to keep this fishery going. Do you want more taxes and more government, or less? Do you want our government to invest in long-term economically sustainable and viable fisheries based off naturally recruiting native species, or do you want to continue to pay more taxes to keep providing fishing for a very select few people? Chinook = more government, more taxes, less sustainable and healthy fisheries and Great Lakes ecosystems. How does this make any sense? It also costs millions for lake trout stocking programs to continue — why keep wasting the money — lake trout can not recruit with alewife around. Michigan DNR = A joke of an agency without any leadership in fisheries. You want examples of where native species are doing well and providing a huge income base for the Great Lakes: look no further than Lake St. Clair. These fish naturally recruit, meaning very few tax dollars comparatively go into managing this fishery. Lake ST. Clair is presently the best bass fishing in the ENTIRE nation according to an article right here on GLECHO http://greatlakesecho.org/2013/05/08/lake-st-clair-best-in-nation-for-bass-lake-erie-in-top-10/. Do you see any articles on Great Lakes ECHO about chinook fishing in the Great Lakes being the best in the nation — no, you don’t. Furthermore, let me educate you on the principles of fisheries ecology. Okay, look, people say we need salmon to boost local economies. Even in their native habitats, habitats that are not anthropogenically modified with dams, and controlled flows, and pollution, even in these habitats chinook salmon returns to rivers are extremely variable from year to year and so are the fisheries. There is very little that people can do to predict how the fishing for chinook will be this year, or next year for these species EVEN in their native habitats. Why in the hell would anyone think that in a place where chinook never were supposed to be in the first place (the Great Lakes) that they would be more consistent from year to year in catches and returns? Makes NO sense. Seriously, explain that to me — you can’t, and even the best fisheries biologists and the DNR can not explain why that would be expected. Thus, you could have fisherman and tourists spending hard earned dollars to go salmon fishing and not catch anything in a bad years and they will never, ever come back. Does that benefit local economies and those who may have invested everything they got in hoping for those tourists to return next year. Makes no sense. On the other hand, if we have naturally recruiting fisheries that we CAN count on to be consistent from year to year and that are awesome such as in Lake St. Clair, people will come back every year and people can build their businesses and lives around that. Fishing towns became ghost towns because salmon fishing dried up — don’t you think we should invest in more consistent fisheries that people investing their life into (guides, homes, families etc.) and investing tourist dollars into will get way more in return from? Not according to your Michigan DNR — they would rather waste our precious resources and tax dollars and continue to beat back chances at native species recovery. And please, don’t anyone tell me that chinook fisheries contribute 7 billion a year to local economies. That number may be right, but it applies to “all species fished for in the Great Lakes,” NOT solely chinook fisheries. It makes sense though the MDNR has a self-interest in protecting their jobs — which includes the many tax dollars that go into these ridiculous programs. Are they really investing in our future and protecting our resources, or protecting their paychecks and special interest groups? Here’s another argument: If people and the MDNR want to protect the alewife, well hey, why don’t we start also protecting round goby (another very harmful invasive species)? What, blasphemy you say? Ok, maybe, but one of the reasons smallmouth bass, and walleye, and perch, and whitefish, and burbot, lake trout, and other native great lakes fishes are doing well and rebounding in some areas is because round goby have proliferated and provided a food source for them. They are importnat in the diets of waterbirds also. So if we protect the alewife, lets protect the round goby too right? Oh and wait it does not end there — if we protect the round goby, well we have to protect their food source too which are mainly quagga mussels — another harmful invasive species. You know, whitefish are now eating quaggas too, so we should protect the quagga mussels right MDNR? I mean where does it end Michigan DNR, where does the mismanagement and waste of our tax-dollars end? If you want a chinook fishery — it NEVER ENDS! It’s like a continuous bad nightmare that you can’t be woken up from. Lastly — why do we in part have so many invasive species, such as round goby in the Great Lakes? Because over the years, there has been a lack of “toothy predators.” Especially in regards to native species, such as walleye, perch, burbot, and lake trout. These native species, especially when they naturally reproduce and recruit provide one of the most important buffers to non-native species invasions because they eat invaders. Here’s a very relevant example. In Lake Michigan, where the DNR is now choosing chinook and alewife over all these native species, well, they are opening the door even wider to invasion by asian carp. Do you think chinook will be around to eat invading and young of year juvenile asian cap — ha yea right, and what about years where their populations are not doing well and may be small – Great Lakes chinook only mainly eat alewife and the literature supports this. Walleye, lake trout, perch, and other native piscivores have diverse diets that are flexible. They can adapt to eating what’s around — especially species like asian carp and other non-natives that have not co-evolved the tools to escape such predation. So, by choosing alewife and chinook over these native species in Lake Michigan the MDNR is further opening the door for asian carp invasion into the Great Lakes. You want to stop them from coming in — support restoration of native toothy predators not chinook and alewife. And if it’s not asian carp, it will be something else that gets in unless we provide a buffer by supporting native species restoration. So way to go MDNR, looks like you also support the invasion of asian carp or other non-native in the future through your mismanagement. Shame on you Michigan DNR. Please quit wasting our money and sabotaging the future of Great Lakes fisheries through these management practices. You are supposed to represent the people (taxpayers) who write your paychecks, not special interest groups. I am ashamed to be represented by a subversive, power-hungry, unilateral decision making governmental agency that faces no repercussions for such environmental destructive behaviors. Tom, even if it could be done, restoring native fish populations will do nothing to slow the spread of invasive species. And even if we could get rid of alewives – and knowing that you won’t stop the invasives with more “toothy predators” – why would you want to sacrifice a multi-billion-dollar sport fishery that puts money in the pockets of tens of thousands of Great Lakes residents who work in hotels, restaurants, gas stations, marinas, bait and tackle shops, gift shops, on charter boats and in other businesses of many types? There is terrific fishing for many “toothy predators” in bays, harbors, rivers and lakes, yet those waters are still packed with invaders. The feds spend millions annually (and have done so for decades) trying to restore lake trout that few people outside the tribes that can net them want to target. The entire ecosystem has been irrevocably changed by the No. 1 invader of them all, quagga mussels. Scoop there is no logical reason for anyone to fight against restoring native fish populations. We have a healthy invasive species population, increasing/protecting alewives is not helping the situation. Got it now? If only it were that easy. Even if lake trout hadn’t been decimated by overfishing and SEA LAMPREYS, every problem invasive we have today would still have done what it’s doing because they’re able to live at depths where no/few predators live, and reproduce faster than predators can. Charters use downriggers …. Oooooo-K. So what? They also use diving planers and surface planers that carry baits far from the boat with leadcore line, copper wire and various “ounces” of lead to get baits down and away to catch fish easily-spooked after sunrise by the large downrigger weights/cable. “Sport” fishermen use the same. It’s a way of presenting baits for the best possible chance of hooking up, AKA SPORT fishing. Have you ever done it? For the record I do not hate the DNR or anyone else, not even Scoop, I have no use for such “me first” people no one does. Very big difference, whether you understand what that means, I couldn’t care less, very sad really. None of the invasives is doing anything wrong including alewives, they’re just doing thier “Thang” here, where they don’t belong, the varible/defect in the process. Anyone can figure this out if they want to. Joe you are right, commercial fisherman controlled the lake once, and overfished it causing the problems we face today. The charters are a commercial enterprise use downriggers instead of nets, not a sport fishery. But they can’t control the lake without the blessing of the MDNR Fishery division, the fault and accountability lies with them. I was very naive when we started this, I thought we were supposed to be protecting our natural resources. Ol’dopey me, what was I thinkin! You’ll have to forgive me, I still want to protect OUR natural resources! Scoop, I’ll make it a little clearer. You’re losing money in favor of supporting the local salmon charter. There was a man who declared, as you, that this is the right thing to do without discussion. This is what he had to say. Now, how democracy has no connection with the monetary unit, you tell me. Tom, good luck with a blind monkey catching a chinook! There are a lot of trollers and pier anglers struggling to do so even with “perfect” water temperatures right now. There are so many alewives out there this year that you better hope those anglers continue to struggle so salmon can keep eating the alewives you despise. The most consistent fishing so far at least has been for southern basin cohos, offshore steelhead and bottom-hugging lake trout in Lake Michigan and bass, perch and walleyes in Green Bay. We love different fish. I target panfish (including perch), bass, walleyes, pike, muskies and more, in addition to salmon and trout. And, of course, I don’t think it’s wise to approach the Great Lakes as I’ve mentioned. However, if I was in the position of having to make a decision as such, it would be difficult to impossible for me to take a different course of action and expect a result other than that of something random. Well campers, the bottomline is we don’t need more invasive species. We surely don’t need more zooplankton eaters, I’m also tired of algae slop because we have too many “planktivores” and I don’t care if the DNR can’t “just change to another fish” at thier hatcheries. All Scoop and friends need to do is change to a different fish, but that’s too hard to do. I only spent 10 years in the Third grade and I can figure this out, one would think a biologist can, but that’s the problem they did. There’s an old saying, “One Dirty All Dirty” I can’t say scoop doesn’t understand the magintude of what’s being done here, because I think he does. The Green pants may end up dragging all thier “friends” down with them, they have no real excuse for thier actions, thier own studies are against them. The fact that Scoop may never catch a salmon agian is starting to sound good to me. This is not why I got invloved, I just want to restore and protect the natural resources like the law and common sense says. The gobies protect thier young and they’re thriving,so we protect ours until not needed anymore, simple. I’d much rather plant a few Perch than raise money for a lawsuit, but it’s looking like we can’t have one without the other. There’s a lot of dirty skirts out there as they used to say, doing the right thing would be much better for everyone. I’m closed minded? Didn’t say the DNR doesn’t have a clue, they know exactly what they’re doing, this is policy, they are intentionally managing the lake for the alewives. Increasing/saving the alewives the alewives is just compounding the massive invasive species problem we already have, keeping the alewives dominant is insanity, but we all are supposed just say OK? If we follow the model being set down south for Asian Carp we should start stripping our boats and buying trammel nets, get ready to harvest them, forget fish biology, science based, ecosystem based management, just sacrifice the lakes and live with it! Give up without firing a shot, because alewives come first? Because lake trout don’t fight hard enough? So you can sit in a bar and brag about catching a planted 20 pound chinook that blind monkeys can catch? Failing to mention we all are expected to pay for it, sacifice the entire natural ecosystem so you can do that? You and your friends refuse any compromise, “chinook or nothin” and I’m closed minded? I can see lots of work for biologists, I can see us all working together to fix this problem, it can be done! We have everything we need except cooperation! The loss of the chinook would be the best thing that ever happened to the lakes, because the chinook was the worst thing that ever happened to the great lakes. Makes Lake Michigan an invasive factory, the point source for most invasive spread south and west from here, but your OK with that. Maybe you can sell your boat and start an Asian carp proccessing plant, and brag about how many “big fish ” you killed today! Scoop, check this out, as an engineer it seems alewives are good at consuming PCB’s, bacteria, and what not. I’d stock just enough salmon to keep them in check. I wouldn’t allow anyone to fish for salmon. I’d then let the round gobies thrive, but not flourish to the point of killing themselves off. They like to eat zebra and quagga mussels. This way you restore as much plankton as possible to filter out nutrients that you’re trying to prevent in the first place. If it kills off other fish, good. That means more plankton. When it comes to nutrients, the phragmites really shine here. You may end up with a few more diseases to sort out, but you’d end up with a healthier water supply until you could really figure out how to get rid of the invasive mussels. When you get the system tweaked you’ve got water and can look somewhere else for food. Tom, as always, your “facts” are interesting. I’m convinced you will always see things with a closed mind, and that’s why you lack credibility. You remind me of the barstool biologists who think they have all the answers for deer, turkeys, wolves and so much more, while the DNR sits “in their cubicles” and “doesn’t have a clue” about “the real world.” It’s always “we’re right and you’re wrong” and yet there are thousands of folks like that, many with different beliefs (but they’re “all” right). Yes, that is impossible. But it doesn’t stop them from continuing to believe in themselves and their closed-minded view of any particular topic. Well if you read you know the USGS says Asian Carp only need 16 miles of river to spawn. I believe if you look you’ll find they can spawn over gravel requiring zero miles. ( Actually I have a study that says Bigheads like spawning on gravel) and maybe eggs will die if they settle in certain areas study to follow. Maybe? Do we risk the entire Great lakes on a maybe the eggs will die? So we know they can spawn, we know they have plenty of food, but maybe the eggs will die if they drop to the bottom. Lots of fish broadcast spawn in our rivers, have for thousands of years, some not so long seem to survive hitting the bottom. Perhaps the Rusty crawfish will eat all the eggs? That’s what the DNR said happened to the walleye eggs in the Muskegon river, Rusty crawdads don’t seem to like salmon eggs only walleye eggs it seems. Perhaps you think I’m too harsh or judgemental, not at all, just stating the facts. After 9 years of “rusty crabs eat the eggs” and other BS etc.. and they’re banging limits of Walleyes in June on Saginaw Bay, and we get to watch alewives spawn in June and catch nothing! I’m at the point where I don’t care if I ever see another salmon or trout again! I do not need a PH of D to see what the problem is, and who’s responsible, and it ain’t the invasive species! Joe there was a stamp for salmon, they eliminated the stamp itself, but you have to buy an all species license to fish salmon and trout. Next year they eliminate that, “one license fits all’ This is Michighan, I Wisconsin has lake salmon stamp, and inland salmon stamp, why? ain’t got a clue didn’t ask. The salmon were planted to control alewives AND create a fishery, “Deep sea fishing in our own back yard’ I believe was said at the time. My understanding is that Tanner was told to do something spectacular. Native fish were gone, pollution everywhere alewives dying on the beach interest down etc… Most people don’t know the original plan was and still seems to be a self sustaining salmon population. Please find ( Ecological Factors Affecting the Sustainability of Chinook and Coho Salmon Populations in the Great Lakes, Especially Lake Michigan 2002 Hansen,Holly) everything you need to know. When they started the salmon experiment they thought they would never run out of alewives, (I gave the DNR that publically, at the time I didn’t know, I trusted the DNR was doing the right thing) it’s what they did when they found out they could run out of alewives, the results are the mess we have now. In 1978 they started to restore the Walleye in the Muskegon river system, th main spawning/nursery for walleyes for most of Lake Michigan, down to around 2500 at the time. As the Walleye population grew the alewives dropped, Perch came back life was good. Except the salmon guys were crying wanted to stock alewives as some want to do today. The MDNR took the Walleye reaing pond away from the steeheaders started planting in June right in the middle of spawning alewives, walleyes dropped (overfished) alewives came back, lake been going downhill ever since. I was there watched the whole thing. We need no native fish stamp, our license money is supposed to go for that and the Dingell – Johnson act (tackle tax) money is supposed to go for restoration of native fish, but the MDNR fishery Div. is stealing it to plant salmon and trout, non-native. Perch is the most feared by the DNR (as you can tell from Scoop) they talk like Lake Michigan is separate entity, we should just let them have it, but they need the inland rivers and nurseries for both alewives and chinook, native fish in high numbers would control that. That’s why Perch limiis 50 per day, not closed during spawn, and walleyes stocked at a size perfect for alewives to eat. Read the Saginaw Bay recovery plan, the principles apply any where. I am not a fish biologist, I don’t need to be, I pay biologists to tell the best thing to do to protect our natural resources. However the biologists we have say restoring the alewives is our best course of action. Since there’s no logical reason to want alewives as dominant, we need some new biologists. Tom, has anyone in the Great Lakes area considered switching the use of stamps to native game fish? In most state parks where fishing is encouraged, you have to pay a few dollars to access the property. This money goes towards upkeeping the park, including native fish populations. This ensures a healthy balance of aquatic life to allow anglers to catch a few fish (usually bass). If stamps were required in the Great Lakes for native species, it would take emphasis away from the salmon as a fish for angling. Salmon were never put into the Great Lakes for angling purposes which should be emphasized. I know support for it wouldn’t be there since you’ve already mentioned there was no support for reducing fishing for salmon. I’m just curious. We have many fish that will go into skinny water to feed, and Asian Carp don’t come out of skinny water at 20 pounds. I’ve seen 2-3 inch silver carp jumping in the main river, bite size and plenty of water for any predator I can think of. It’s simply a matter of sufficient numbers of predators to control them. I would also point out Chinook cannot survive warm water let alone skinny warm water and only eat alewives, thus useless as predators for the other 180 other invasives and asian carp. Plus alewives eat the same zooplankton we don’t want asian carp to eat, thus the same impact as asian carp when alewives in high numbers, which is the plan. Miss that part Scoopy? Sounds like a hard to sell product to me. It’s cheaper catching and cleaning pacific cod. It seems if the government wanted to fish asian carp out, they’d catch them, offer people a chance to puchase them at cost at the docks, then dispose of them. Otherwise, I’m sure businesses in Illinois could deliver a product of no less quality to China at a lower cost. Gut them, wash them, and freeze them. Entrepreneurship. I’m sure the eating population of China will put a dent in the carp population here. Why use a big predator when a small one will do? True we have no predators for 20 pound+ Asian Carp, but we have several for the eggs fry and juveniles of asian carp. Spiny fleas are very small, but are major predators of zooplankton, thier impact is determined by how many there are, right now there are too many, they are devastating the zooplankton, yet never grow too big for predators. So size is not the key to control. Predator type is, or the most effective if you will. Asian carp are the kings of the plankton eaters, thier edge is they can grow too big, thier weak spot is the same as all fish, surviving the spawn. Predators control that outcome, we can control how many predators they run into. We need to focus on what we can do, not “nothing we can do” because there’s always something we can do. Protecting alewives is an example of what not to do, alewives aren’t very big but do great damage to zooplankton populations in high numbers. So quit lookinmg at size and look at the problem. The problem is too many invasive species, and alewives are an invasive species always will be. We need to reduce invasive species or “minimize” thier impact as the experts say. I’m willing to start with the alewives, worked great in Huron. Do Asian carp have any predators? There are no North American fishes large enough to eat an adult Asian carp. White pelicans and eagles, however, have been seen feeding on juvenile or smaller adult Asian carp. Largemouth bass have often been observed feeding on small juvenile Asian carp, and many other native predators probably also feed on them before they grow too large. However, Asian carp produce many offspring which grow quickly and, if conditions are good, rapidly become too large to be eaten by North American predators. Juvenile Asian carp are also known to move into very shallow water where they are inaccessible to many large predators. There is nothing wrong with making profit from asian carp and keeping them here. After all, it looks like they’re here to stay anyway. My problem is if you open up a plant to process asian carp, you have to actually make profit independant of government subsidation. This is where predators come into play. No further comments huh. If I may friends in Bath Illinois want thier river back. They started the Redneck flyin carp tournament to bring attention to the problem. Every year we catch more Asian Carp even tho they commercial fish the area heavily, (They don’t want silver flyin carp, Cninese like bigheads) These plants make getting thier river back harder. The plant reffered to in this article the Chinese put $2.5 million bucks into it, that’s 2.5 million reasons why they wont let anyone get rid of asian carp. With Illinois and other southern states gearing up to keep permanent breeding populations of asian carp, this is not just a threat to the great lakes but the entire country. $150 million bucks so far and we’re making safe zones for asian carp? They wanted to avoid giving them value at first, but there it is. What good is thousands of studies and facts if we’re just going to ignore them? If asian carp truly had no predators, then after 10,000 years they would be the dominant maybe only freshwater fish in the world, because we would have brought them here like common carp after we fished out the local fish population. Most people wont read these studies, but you should read some you paid for them. Go to Illinois and see for yourself, get some perspective. Please google common carp control using predators Sorenson. Dr. Sorenson would like to get a nationwide carp control program going. He advocates the heavy use of restoring predators, after removal. The most effective being egg eaters, which Perch are among that group. 100 pounds of adult asian carp could be only 2 fish. 100 pounds of 3 inch asian carp is 1038 fish (I asked an asian carp expert how many 3 inch in a pound 138) so attacking juveniles much more effective. Numbers of invasive fish removed versus pounds much more effective. No market for asian carp eggs, fry or juveniles, but food source for many native predators, now it’s just a matter of numbers. We have a forest fire of of billions of asian carp headed north, we need a back burn of native fish/predators headed south. Before scoop trys it, most states only tried a little to get rid of common carp. In Michigan they only took 2 shots I’m aware of and gave up, Croton pond, Fremont lake.Fremont Lake still has carp but few, also has zebra mussels but hard to find, it does have a healthy Perch population, well over 30 years now. Places that restored predators worked. Restoring predators is just one tool in the tool box, and does not interfere with any asian carp or any other invasive species plans for that matter. We are not in danger of having too many native fish. We already know how too fix that, you don’t have to beg people to eat a Perch or walleye. Alligator Gar do not do well in climates much further north than St. Louis. Fact. You could stock millions of predators into the Illinois River system and still not even make a dent on Asian carp. Ask folks on the Mississippi River, who have predators aplenty (and probably had more when the carp first were starting out decades ago), but still couldn’t stop ’em. Exactly. Plus they’re very bony and unless subsidized, most commercial fishermen say they’re not even worth the effort it takes to pay workers to net and clean them. If it were only as easy as “net ’em all” or even poison ’em all. If I may, these plants create safe zones for asian carp. They have to maintain/protect a breeding population to protect thier jobs. It looks to me the Chinese are cutiing out the middleman, (American owners) so profits will go to China. We have native residents that will eat asian carp for free. Predators, increase them, no need for immigrants. I’ll eat an asian carp after you run them thru a Perch or Walleye first!